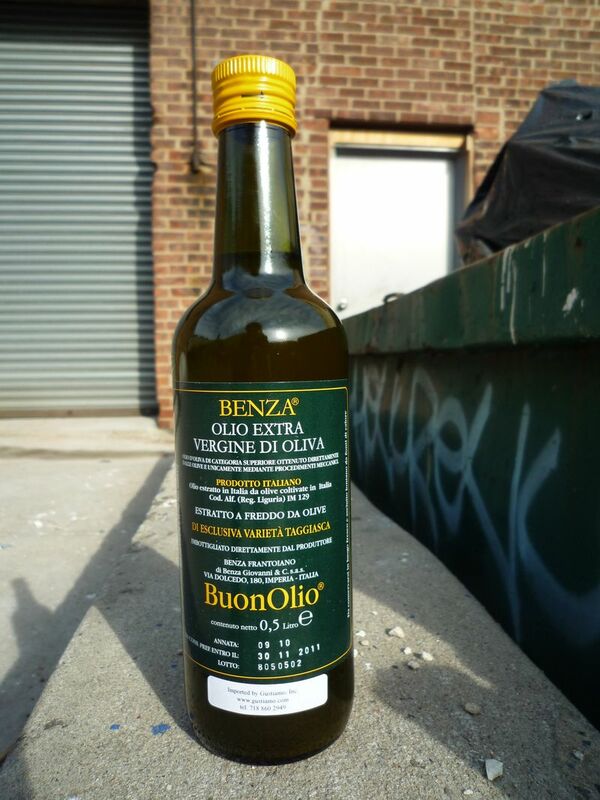 Gigi Benza and his mother Claretta make the BuonOlio EV Olive Oil. It is not just Buono; it is Buonissimo!!! How do we find new producers, friends ask. It varies; in this case, a few years ago, we wanted to include a Ligurian Oil, in our most discriminate “carta degli olii italiani” and we asked our good friend Fred Plotkin. He is the true expert of everything Italian and, in particular, Ligurian, since he spends much of his time in this magnificent region. He said: I LOVE frantoio Benza. So, here I go. In the spring of 2007, after a few conversations on the telephone, I landed in the small airport in Albenga, near Imperia, to meet the Benza family and taste the olive oil on the spot. Due diligence was completed with an “exceptional” on all counts. But Gustiamo is very slow and we did not start importing BuonOlio until Stefano joined us, in the Summer of 2009. He would have not worked with Gustiamo if we did not have the best EV Olive Oil from Liguria, his region. Stefano also went to see Gigi and Claretta an gave his final blessing to Gustiamo’s partnership with BuonOlio. BuonOlio EV Olive Oil is 100% from taggiasca olives and is DOP Riviera dei Fiori, Gigi has all the certifications, but he, as with many other Gustiamo producers, is reluctant to use them and does not put the “DOP” label on the bottles. Who cares? Liguria is famous for its olive oil: weather, vicinity to the sea, calcareus soil made it perfect to grow the local Taggiasca olive trees. But the olive groves are perched on terraced hills, very difficult to cultivate with modern machinery, olives must be picked by hand and the groves are progressively being abandoned by their original farmers, giving space to fires and desolate landscape. Gigi is a passionate young man with a big heart, hopes and a clear vision for his future: he wants to do good for his land and his beautiful region! A few years ago, he started to buy abandoned tree groves, reclaiming the landscape to its original magnificence. He has now 4,000 trees. We wish him good luck and more BuonOlio for Gustiamo and our friends in the future!!! Thank you for keeping me on your mailing list. It is something I look forward to, especially all the new products that are available. Tietel Grocery several years ago. Out here its virtually impossible to get some products. I just wanted to mention those things. have a great new year and thank you again. Grazie John for your nice words! tanti auguri di buon anno to you too!!! Jon!!! is it really you??? REALLY? i’ve been trying to reach you for ages. glad BuonOlio reunited us! would love to reconnect. email me. you know the address! grazie mille! Bravo for your stewardship of the land and for producing such fine oil. I recently read of someone in Vernazza who organizes work crews to help maintain natural coastline areas that have been battered by tourists.. perhaps you could get some travellers to help you rehabilitate more olive groves in Liguria!